We see the economy on a growth track, but after a year of strong returns and historically low volatility, some moderation to growth and risk appetite seems reasonable. Continued economic growth, without a notable pickup in inflation, remains our dominant view. Last year’s tax changes, and new federal spending initiatives, have the potential to lift investment and speed up growth. Risks to our outlook include rising trade and geopolitical tension, elevated asset prices in some areas, and rising interest rates. 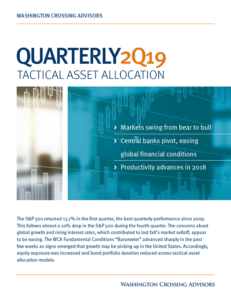 During the quarter, we made a few tactical adjustments to portfolios. 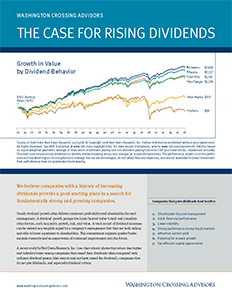 We tilted portfolios toward large cap domestic value, and away from large cap growth. Increasing relative valuations in the technology sector encouraged that decision. We also increased real estate (REITs) to overweight given an improved return expectation versus high yield bonds. Finally, we reduced equity exposure, and increased bond exposure, due to slippage in our Fundamental Conditions Barometer.